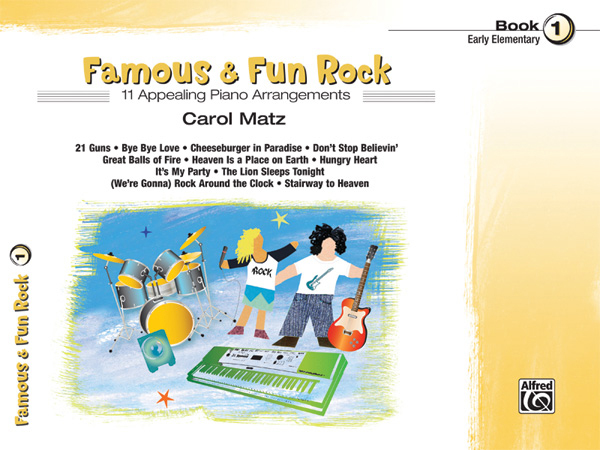 * Famous & Fun Rock, Book 1, is a collection of appealing arrangements of familiar songs that students are sure to know and love. * Written at the early elementary level, it may be used as a supplement to any method. * Titles: 21 Guns, Bye, Bye Love, Cheeseburger in Paradise, Don't Stop Believin', Great Balls of Fire, Heaven Is a Place on Earth, Hungry Heart, It's My Party, The Lion Sleeps Tonight, (We're Gonna) Rock Around the Clock, Stairway to Heaven.